The release of superstar Vijay's Tamil movie "Puli" has hit a roadblock after early morning shows and overseas premiere of the film were cancelled for reasons still unclear. The shows of the fantasy-drama film that were scheduled as early as 4 a.m. and 5 a.m. by theatres here on Thursday stand cancelled. "Even we are not sure why we have been asked to cancel the special shows. We are waiting for go ahead from Qube to release the film," a theatre representative told. According to an industry source, the makers of "Puli" were yet to get clearance from Qube - the company that streams movies digitally. "Rumour has it that producers of 'Puli' are yet to clear dues to Qube. As soon as it is settled, theatres are expected to get the green signal to screen the movie," the source told. Another source said that due to the Income Tax raid on the producers and financier of "Puli" on Thursday, they are yet get financial clearance to pay exhibitors. "Due to the IT raid, the producers were not allowed to move funds to clear last minute payments. This could be one of the reasons why exhibitors did not get clearance to screen the film," the source said. Theatres here that had planned to screen the film at 8 a.m. and 9 a.m. have also cancelled the shows. "We hear that we may get clearance to screen the film from noon onwards. But we still are not sure about the same," the theatre representative said. The film's overseas distributor Atmus Entertainment posted on their Twitter page on Thursday that all the premiere shows were cancelled in Canada and the US. The release of the film in its dubbed Hindi and Telugu versions also remain doubtful. High drama prevailed ahead of the release of ‘Puli’, as the special shows of the movie were cancelled this morning. Following this, Vijay fans resorted to violence and a theatre in Krishnagiri was reportedly attacked. As some financial issues were to be settled, the film did not obtain lab clearance. Finally, Vijay stepped in and gave an undertaking, following which the film got ready to hit the screens from noon. “Qube confirmed that the KDM will be loaded by 10.15 am …. So finally #Puli all set to roar at #Vettri from 11.30 am show …” Rakesh Gowthaman, managing director of Vettri Theatres at Chromepet in Chennai, posted on his online page. On Wednesday, officials of the Income Tax department conducted raids at the properties of Vijay, Samantha and Nayanthara, it may be recalled. 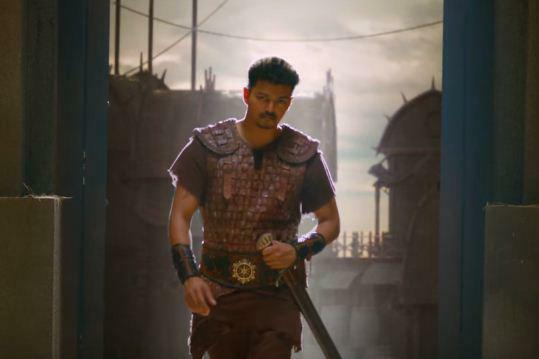 Raids were also conducted at the production house of ‘Puli’ too. Directed by Chimbu Devan, ‘Puli’ has Vijay, Shruti Haasan, Hansika, Sridevi, Sudeep and others in key roles. Music is by Devi Sri Prasad.